Numerous Doctors from the United Kingdom are moving to Australia through Australia skilled immigration visas such as Employer-Sponsored Nomination Visa, Australian 190 Visa, Skilled Independent 189 visas and 457 visas, temporary work visa. Doctors who have already emigrated to Australia say that higher rates of pay and better working conditions have tempted them to make the switch from UK’s NHS to practicing abroad. In July 2015, just ten days after the UK health secretary, Jeremy Hunt announced new contract proposals for NHS staff 3468, UK doctors have applied for permission from the General Medical Council for certificates to practice abroad. OZ has always been a very popular destination for UK doctor’s reason being salary rate can be up to 50% higher and working hours are shorter. 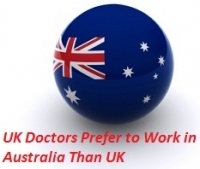 However, we find recently there has been an increase in the UK doctors and Nurses immigrating to Australia. As per the recent Organization for Economic Cooperation and Development (OECD) report, the nation does require a minimum, 26500 new doctors, and additional 47,700 new nurses. The OECD is an organization that states that they promote policies that improve the economic and social well-being of people around the world. Regarding meeting the OECD standards for healthcare provision, Britain is struggling.